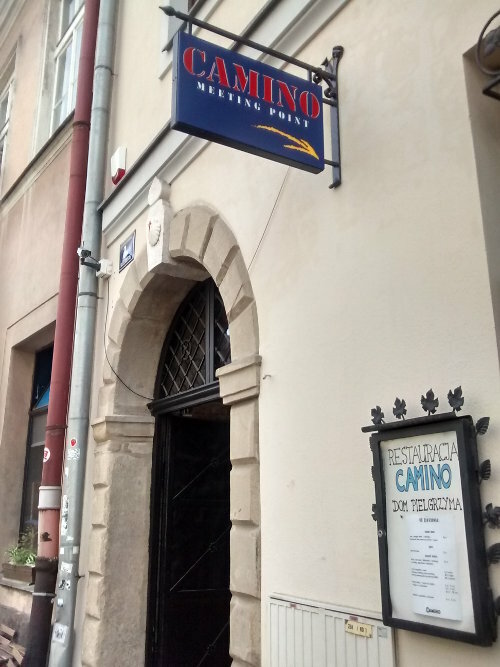 Another Long Walk: Post 7: Welcome to Kraków! After five weeks, my time in Sopot had come to an end. It was time to see more of Poland, and for the second half of my Polish adventures, I moved to Kraków. Kraków is the second largest city in Poland (Warsaw, of course, is the largest) with a population of about 750,000 people (with about 8 million people living within 100 kilometers) and it is the most popular area in Poland for tourists to visit. But first, I had to get there. I woke up early my last day in Sopot and took a walk along the waterfront watching the sun rise over the Baltic Sea for the last time. A couple of hours later, I was boarding a train that would take me all the way to Kraków in the southern part of the country--about a five or six hour train ride. The train passed by Malbork Castle (hey, castle, I remember visiting you! ), making relatively few stops along the way to pick up and drop off passengers. I was taking the train to the end of the line, though, and stayed put. The train quickly filled, but I was pleased to see that nobody was assigned the seat next to me. My official seat was an aisle seat, but I moved over to the window seat to enjoy the view. That lasted until Warsaw when a blind man arrived who had the window seat. I don't want to sound raciest towards blind people, but I found myself a little annoyed at this. Why does a blind man need a window seat?! I've never been through Poland before--seems fair that I should be able to look out the window and see the scenery go by! The train arrived at the end of the line in Kraków pretty much on the nose when it was scheduled. I hadn't gotten off the train for more than about 5 seconds when I heard my name being called. A short red-headed girl was getting my attention: Agata. I didn't know anyone in Kraków and neither did Karolina to set me up with a place to stay, so this time I had the school I signed up with put me with a family. It wasn't really so much a "family," however, a 30s something woman living by herself. I was told she was a "musician" which made me think she played an instrument--but professionally, she's a singer. Interesting! Agata would be my roommate for the duration of my stay in Kraków. She might never talk to me again after seeing that I posted this photo publicly, though. =) We went out for lunch in Podgórze--which was the location of the Kraków ghetto during WWII. In any case, I had emailed her earlier in the week and she said she could be at the train station to pick me up which was great since I had no idea where she lived or my way around Kraków. She pointed out the trams I'd have to take to school--her house was several miles outside of the downtown core where the school was located. It is technically walking distance, but when I mapped it on Google, it said it would take over two hours to walk. One way. As much as I would love to spend five hours a day walking back and forth to school, I just didn't have time for that, and I'd have to commute instead. It would be the first time in my life I ever had to commute regularly to anything. I've always worked and gone to schools within easy walking distance of where I lived. I felt a little lost in Kraków. Within ten minutes, I'd never have been able to find where she had parked her car. I had absolutely no idea where in Kraków I even was. I was trying desperately to create a mental map of the area as we passed through everything, the car threw me off a bit, breaking different parts of town into areas that didn't connect in my head. I needed a map to look at too. Eventually we went back to her place at the far eastern edge of Kraków. It was so far out there I wasn't entirely sure we were actually IN the city of Kraków anymore, but we were. Barely! I went for a walk around the neighborhood to get my bearings, but there wasn't a whole lot to see in the immediate area. A few shops and lots of housing, and eventually I headed back for the night. The next morning, I took a bus to a tram stop, then took a tram the rest of the way into town following my progress on a downloadable map on my smartphone. I got an early start, just in case I did something stupid and got on the wrong bus or train or had trouble finding the school. They also asked me to arrive earlier than normal so they could interview me and see where my Polish stood. I arrived at the school without any trouble, though, and was quickly shown around the place before my interview. After school was over, I wandered over to where I was told I could get a monthly bus/tram pass. I expected to be in town for five weeks and would need to commute on a daily basis, so a monthly pass seemed like a good idea. I purchased it (about $25, as I recall), then took a walking tour around Old Town to fill out my mental map of the place. Which is when I spotted it: the fort from the front of my bus card! I could totally recreate the photo from my bus card. =) I had seen the building before when Agata was driving me around the day before, but I had no idea where it was located until I just stumbled into it. The bus card had a tram going by the fort, so I lined up the signs and trees from the photo as best I could with the actual location, then waited a few minutes until a tram went by and snapped a couple of photos. Perfect! I had held up the card in the photo so both the card and the real-life setting would be in the photo, but I decided I need one without the card it in as well. The photo on the card didn't have someone holding a bus card up, after all. What do you think? A pretty good imitation of the photo on the card? It was really hard to get the tram in JUST the right spot because it's moving. It's not at a stop! Here's the second version I took without the card in the photo. Then I stopped somewhere for dinner--I don't even remember where anymore--before taking a tram back to Agata's place. For the first week in town, that was my usual routine. Take a tram into town, go to school, walk around a new area of Kraków within easy walking distance of the school after school, find something for dinner, then head back to my home away from home and do homework. Another day that week I returned to Kazmierz--the Jewish area of town. Another time I headed to the Podgórze region where the Kraków Ghetto was established by the Nazis during WWII. That was a somber visit, knowing that area had been used to terrorize and persecute the local Jewish population. Interesting note: the most famous survivor of the Kraków Ghetto is Roman Polanski. Which struck me as noteworthy because he's still alive today. There are people still alive today who remember the Kraków Ghetto when it was operating! Reading about it in books is one thing, but walking around the places this stuff happened is another. And knowing that it's not ancient history--that there are still people walking and talking who actually remember it happening. It chilled me to the bone. A preserved section of the old ghetto wall. The wall was intended to look like headstones lined up side-by-side! Sick Nazi bastards. Not that life was good anywhere in Poland under Nazi rule, but they took it up a notch when they created the ghettos. There are still two sections of the old ghetto wall preserved, now a memorial for those who suffered and died in the ghetto. It seemed like an especially cruel joke that they created the wall to look like headstones lined by side-by-side. But, of course, the ghettos weren't even the worst of it. Another kilometer or down the road was the Płaszó concentration camp. It wasn't an extermination camp like nearby Auschwitz, but life there was brutal and thousands were killed and starved. Later I walked out to this area. There's nothing really to see there anymore except open fields and somber silence. Bodies were buried in layers and layers in trenches and late in the war, Germans exhumed and burned them in an attempt to hide evidence of the horrors they inflicted. The setting now was calm. A few people walked around quietly and dandelions dotted the empty fields like a miniature Dr. Seuss forest. I really couldn't imagine what the area must have been like during WWII. The former location of the Płaszo concentration camp is now just an empty field filled with dandelions. Hard to imagine the atrocities and thousands of people murdered here or the heaps of exhumed bodies that the Germans burned near the end of the war. Schindler's factory--of Schilder's List fame is also in this area. I'd never actually seen the movie before and it seemed like it was about time I did, but alas, I couldn't find it available in Netflix back at Agata's place. Interesting, as soon as I returned to the United States, it was available. Seems odd that that movie isn't available in Poland on Netflix despite being available at least some other countries. (I'm still meaning to watch it when time permits!) But I took a tour of the factory, which is just a large museum about Kraków during WWII and actually didn't have many displays about Schindler himself. It was interesting, but it wouldn't have been on my must-visit places in Kraków. Schindler's old factory is now a museum about life in Kraków during WWII. I took three different days after school to hit all of the ghetto and concentration camp areas. It was a lot to take in! I heard that they filmed parts of Schindler's List in this old quarry adjacent to the concentration camp and near the Kraków ghetto. Pope John Paul II's helicopter. Then there's the Nowa Huta section of Kraków, built during the Soviet area and is famous (or infamous) for the utter lack of interesting architecture. It was built as a utopian city, but is often disparaged as being one of the ugliest, most soulless parts of Kraków--and a tourist attraction for that very reason! I headed out there and found the area to be... well, underwhelming. I suppose of you like wide, orderly streets and solid buildings, it's a nice place to visit. I definitely found the other parts of Kraków more interesting, however. When the Nazis liquidated the ghetto, they rounded people up in this square, stuck them on trains, and sent them off to places like Auschwitz to be murdered. There's even a Camino restaurant and meeting point! I was actually a little surprised to see how much Camino material is available here. It's not like Poland is a popular starting point for Camino walkers--not even most Poles who hike the Camino start in Poland! I really shouldn't badmouth Nowa Huta too much. It did at least have this one semi-interesting-looking (although not particularly pretty) church. But on the other hand, they're promoting the "Wielka Parada Autobusów" here too. That's Polish for "Great Parade of Buses." Seriously--a parade of buses?! That's what they're bragging about? It seems as if this old building was preserved, but they build a new building completely over the top of it! It's a weird site, and I never did find out why this is like this. Did the old building need to be preserved for some historic significance? Why didn't they just build the new building taller instead of up and over the old building? I don't know!